QuickBooks POS is a powerful platform that enables users to follow sales, customers and inventory effectively and quickly. 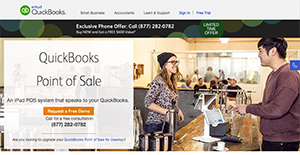 Available in two versions, the Basic and the Pro, QuickBooks Point of Sale is created to bolster businesses’ customer service and meet their needs. It follows the customer’s information and comes with a variety of features to keep improve customer loyalty and retention and encourage repeat sales. These features include tracking their past purchases so you know what brands and products they prefer to buy. QuickBooks Point of Sale can be deployed as an online-based service, on premise, and mobile point-of-sale solutions. Designed for small, medium, and large businesses, QuickBooks POS lets you accept payment via credit cards. Other functionalities include inventory management, customer management, etc. Additional hardware are available, includings bar-code scanners and receipt printers to use with the POS software. QuickBooks Point of Sale simplifies basic daily tasks, thanks to its user-friendly interface that doesn’t present a steep learning curve. The platform automatically updates your inventory without you putting information manually. While many POS options lose you time with credit card payments, QuickBooks POS actually speeds up the process with just a click. Support is a huge boost for QuickBooks POS. The system comes with a very extensive FAQs section. In case the FAQs don’t have the answer to your issue, you can count on their phone support to assist you with your concern. Their online videos provide you with a brief overview of the product and let you interact with the software before purchasing it. Each company has different needs and requires an application that can be customized for their size, type of staff members and clients, and the specific industry they are in. For these reasons, no system can offer perfect tools off-the-shelf. When you search a software app, first be sure what you need it for. Read some QuickBooks POS reviews and ask yourself do you want basic tools or do you want advanced features? Are there any industry-specific functionalities that you are seeking? Obtain the answers to these queries to help your search. There are lots of factors that you need to consider and these include your finances, specific business needs, your company size, integration needs etc. Take your time, use a few free trials, and finally choose the app that provides all that you require to enhance your firm efficiency and productivity. There are three one-time purchase plans offered with starting prices and free trial. POS hardware is sold separately. We realize that when you make a decision to buy POS Software it’s important not only to see how experts evaluate it in their reviews, but also to find out if the real people and companies that buy it are actually satisfied with the product. That’s why we’ve created our behavior-based Customer Satisfaction Algorithm™ that gathers customer reviews, comments and QuickBooks POS reviews across a wide range of social media sites. The data is then presented in an easy to digest form showing how many people had positive and negative experience with QuickBooks POS. With that information at hand you should be equipped to make an informed buying decision that you won’t regret. What are QuickBooks POS pricing details? What integrations are available for QuickBooks POS? If you need more information about QuickBooks POS or you simply have a question let us know what you need and we’ll forward your request directly to the vendor.